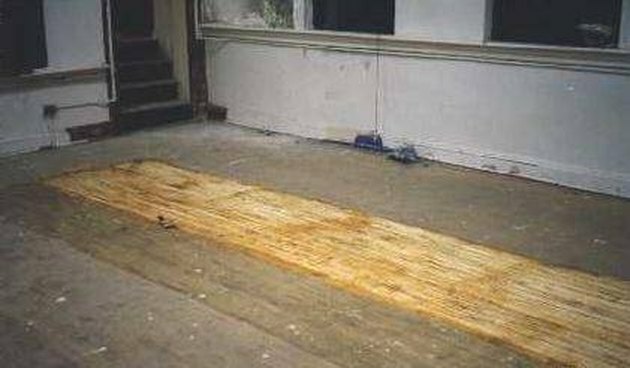 If you have ever pulled up an old section of carpet that was glued to the floor tiles below, you know the sick feeling when you see that old yellow glue staring up at you. Carpet glue was made to stick and almost nothing can get it off. But there is a method that will work to remove carpet glue with a moderate amount of effort leaving your floors tiles clean again. Heat your floor with boiling water to soften the glue. Pour boiling water onto one section of floor and wait for two minutes. Don't wait too long or the glue will start to cool off and harden again. Use your scraper to lift the softened glue off the floor. Wipe your scraper often on a rag. Turn on the heat gun and warm up a section of glued tile. After about thirty seconds, the glue will be softened enough to scrape off. This is a little neater than using boiling water, but it might take a little longer as you have to wave the heat gun directly over the glue. Try using an iron and newspaper if you don't have a heat gun and don't want to use boiling water. Set the iron's setting to medium heat and slide it over the newspaper covered glue just for about 10 seconds and immediately scrape up from the floor. Scrape up as much as you can being careful not to get any glue on the iron. Fill a bucket with 1 gallon of very hot water, 1 cup of ammonia and 1 tsp. of dishwashing liquid. Once you have scraped all the glue off the floor, put on your gloves and scrub the tiles with the scouring cloth to remove any little specks of carpet adhesive and dirt. Rinse the area with clear water and let it dry.